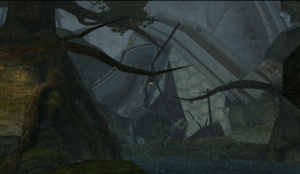 The Frigate Crash Site is a a large valley that leads to the crashed remains of the Frigate Orpheon in Tallon Overworld. This room can be accessed through the Waterfall Cavern or the Overgrown Cavern. The Waterfall Cavern is located at one lower end of the area, while the White Door to the Frigate Access Tunnel is at the other end. The Overgrown Cavern is located high on the edge of the valley with an White Door, and cannot be accessed from below. The center of the room is filled with a large pool of water. Samus can either use the Gravity Suit to navigate along the bottom, or she can use the Grapple Beam to go across the water. When Samus has the Gravity Suit, Jelzaps can be found in the water, along with a Missile Expansion on the underwater wall. When Samus first enters the area, there are two Flying Pirates, who were investigating a container of Phazon, but they flee when Samus arrives. More Flying Pirates will appear on subsequent visits. There are also a number of injured Space Pirates near the entrance to the Frigate. On later visits, the injured Pirates are gone, but three Beetles will appear near the entrance to the Waterfall Cavern. Derelict Space Pirate ship that self-distructed in low orbit above Tallon IV. Faint life signs detected in interior. This lichen seems to be giving off low levels of radiation. No matches found in flora and fauna databank. There is a small crevice detected at the base of this wall. This page was last edited on 19 May 2013, at 02:35.